You know the winds are high when there're windmills next to the landfill. 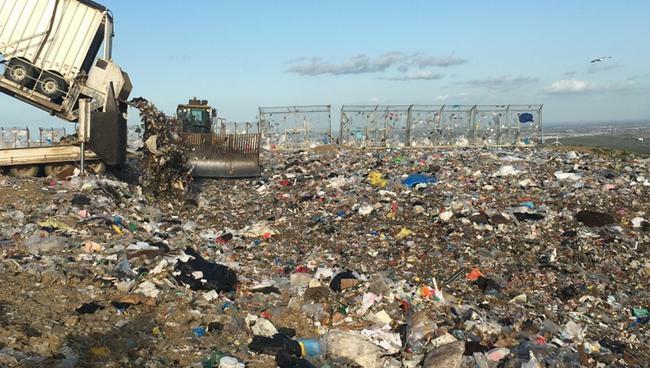 That's why they chose the BULL Litter Fence for this landfill in Livermore, CA. 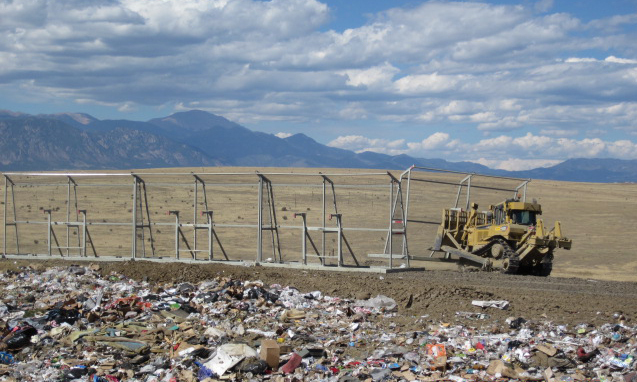 That's a lot of litter being trapped at a landfill in Colorado, saving days of labor cost. ​Each detail combines to make a litter fence that provides all the features you need. Won't blow over in high winds when full of litter. 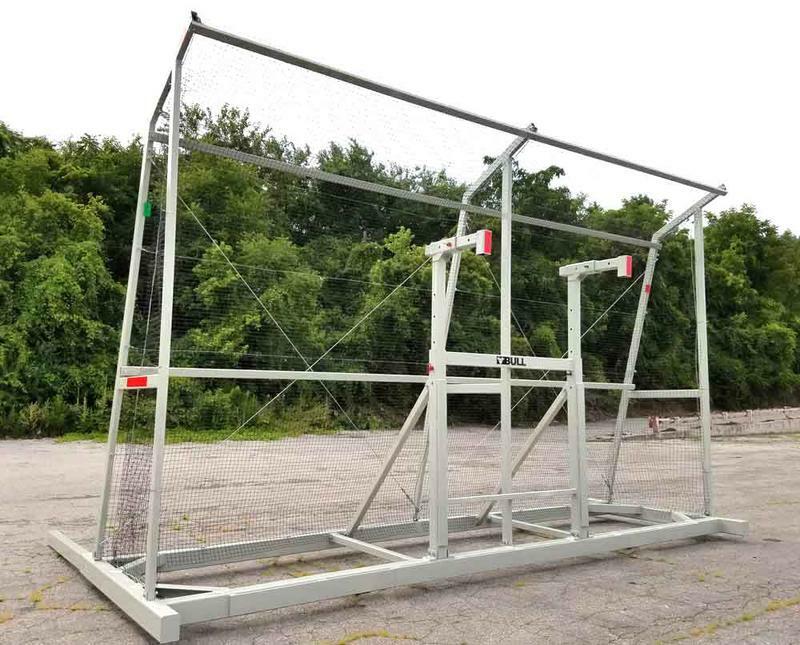 Design includes adjustable outriggers to provide weight distribution. Easy to move so the operators won't mind moving them! Captured litter can't escape because of the side nets and canopy. Built tough enough to withstand harsh landfill environments and being moved every day or more. 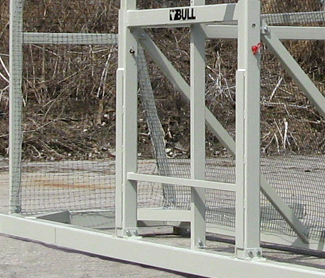 Fully Adjustable Hooks allow operators to easily pick up and move the BULL using a wide selection of landfill equipment. Two hooks help keep the load stable over uneven terrain. 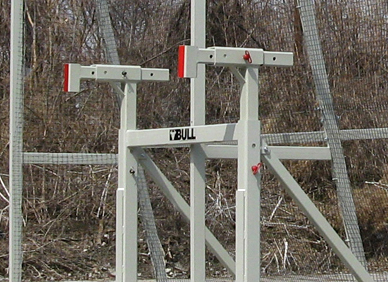 Built-in Outriggers are standard on the BULL to provide maximum Built-in Outriggers resistance. Outrigger is shown in the middle position above. Wear Plates on Front Surfaces provide additional protection and stability. 3/4" thick steel plate welded on to bottom beam and hook supports provide this feature. 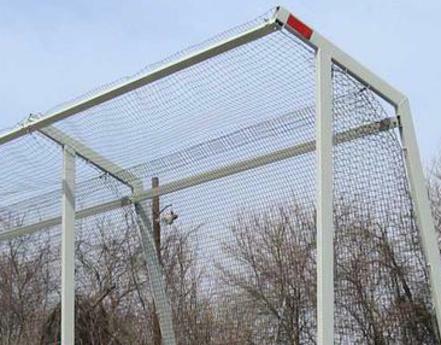 Canopy and Side-nets keep litter from escaping off the edges between adjacent units and over the top. Litter stays trapped even when the wind shifts and swirls. 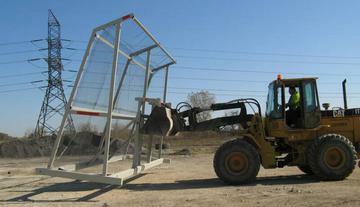 Welded Wire Windscreen is galvanized and vinyl coated, built to take the harsh environment at landfills. The size and weight of the steel components make the Bull stronger and less able to overturn in high winds. ​Best designed units to catch blowing litter for the lowest price. ​Height with Canopy: 15 ft. 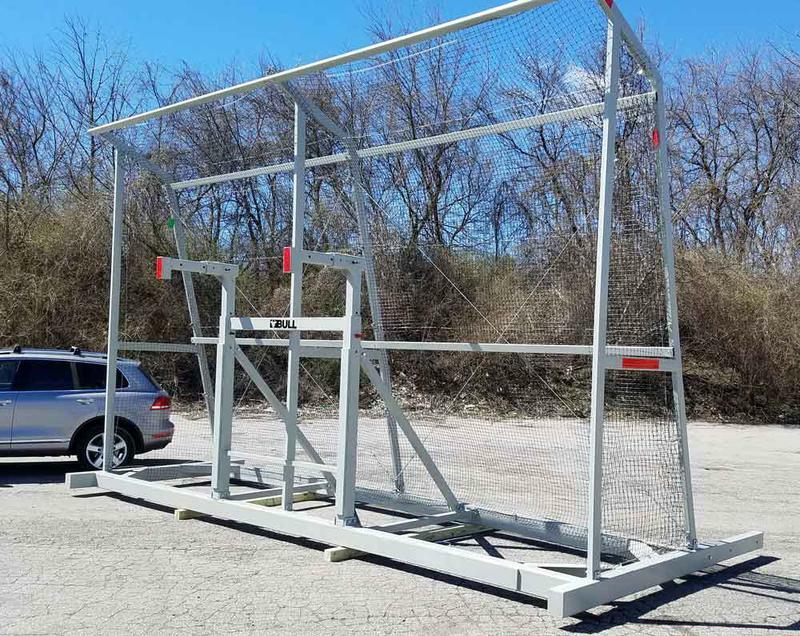 Depth: 8 ft. outriggers can extend the depth to an unmatched 15 ft.
Vertical height adjustment: min. 6ft-9in to a max. of 12ft.-2in. 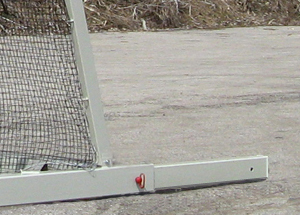 Horizontal hook adjustment: 5 increments from 11in. to 2ft.-7in. Thousands of BULL litter fences are at landfills around the country, stopping blowing litter every day. Proven effective and cost efficient. 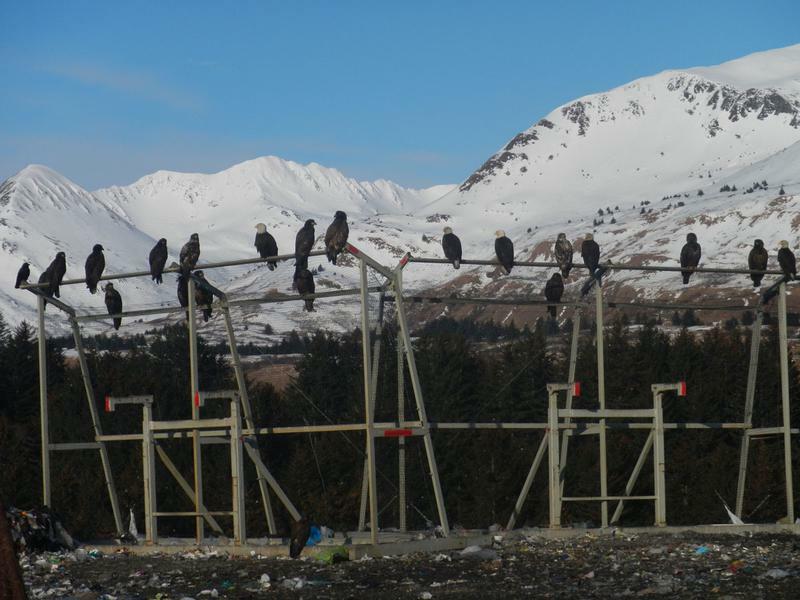 "They do what they're supposed to do - stop and collect litter. What I like the most is their mobility when the wind shifts, which they do here in the bay area a lot. It is easy to get a loader up there and move the BULLs to a new position. They're strudy and strong." The BULL works great in these tipping operations. We are looking to BUDGET for 4-5 BULL Liter Fences, for our Fiscal Year 2016/2017. We currently have 4 that we have been using for the last 3-4 years, and think they are GREAT! I am interested in $$ Figures for delivery after July 1st, 2017.